Two four-legged police officers ended their long careers with the Marine Corps Police Department aboard MCLB Barstow by getting their forever homes with their human partners, Sept. 12. 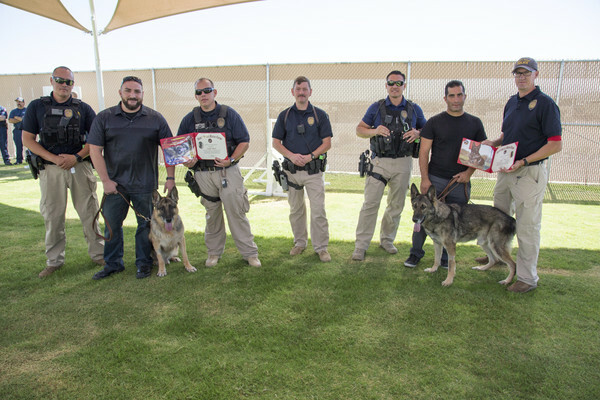 Military Working Dogs “Ricsi” P648, and “Colli” P577, both German shepherds, were officially retired in a ceremony held at the K-9 Training Field behind the Adam Leigh Cann Canine Facility aboard Marine Corps Logistics Base Barstow. Lieutenant Colonel Timothy Silkowski, MCLBB executive officer; Darwin O’neal, MCPD chief; Danny Strand, director, Security and Emergency Services; fellow police officers, and members of the Marine Corps Fire Department aboard the base gathered to see the two MWDs into their well-deserved retirements. “Tony” Nadeem Seirafi was the first of five handlers Ricsi worked with beginning in 2010 aboard MCLB Barstow. He has since moved on to Marine Corps Air Ground Combat Center Twentynine Palms, Calif., but returned for the first time in years to pick up the dog he considers to be a friend. Jacob Lucero was a Marine Corps military policeman partnered with MWD Colli when he was stationed Marine Corps Air, Ground Combat Center Twentynine Palms, Calif., from 2011 to 2012. Lucero moved on after the Corps to become a correctional officer and is now a student in his native Kingman, Ariz. Colli was sent to MCLB Barstow in 2016. He agreed with Seirafi there are some unique challenges to adopting a police dog, but they are worth it for the loyalty and love they give in return.